Do you have an idea or passion you want to turn into a business? Are you currently running a business and in need of support? 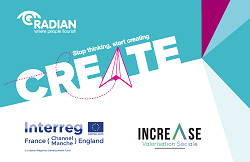 Radian has secured European funding to offer FREE self employment courses and additional support to people living in six key areas over the next three years including Portsmouth & Gosport, Southampton, Eastleigh and Test Valley. Radian's Employment, Support and Training (EST) team, who specialise in supporting residents into employment and training, have successfully supported over 100 business start ups. The 10 week 'CREATE' course is the start of your entrepreneurial journey!